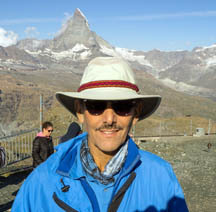 In August 2018 my wife Lyn, fellow dulcimer-player and friend Kathy Spirtes and I travelled to Europe to hike the Haute Route from Chamonix and Mont Blanc in France to Zermatt and the Matterhorn in Switzerland. We signed up with the company Alpenwild for their Deluxe Haute Route hike. Our group consisted of 6 other hikers from around the US plus two experienced guides Mitch (from Buffalo, NY) and Emily (from England). Although I missed much of the hiking due to injuring a knee it was still a great trip! In April 2018 I travelled back to Peru with another small group of New Englanders (including two hammered dulcimer players) to visit Incan sites I didn't get to see on the first trip and to hike the Lares Trek. This Incan trail begins in the Sacred Valley, climbs over a 15,000 foot mountain pass, and ends at the village of Lares and it's thermal hot springs. Those in the group who had not been to Machu Picchu before then left to visit Machu Picchu while three of us continued hiking on what turned out to be a second Lares Trek route (over another 14,000+ foot pass). In the summer of 2017 a small group of (mostly) New Englanders (including two hammered dulcimer players) traveled to the African country of Tanzania where we visited the city of Arusha, Arusha National Park, Tarangire National Park, the Ngorongoro Crater, a Masai village, the Serengeti plains, and Oldupai Gorge where the the oldest remains of homo sapiens were discovered. Both the scenery and the wildlife were incredibly abundant everywhere. In early November 2016 a small group of folks from Connecticut and Massachusetts flew to Peru to hike and camp on the high elevation Inca Trail to the lost city of Machu Picchu. We flew into Lima, Peru and then to the city of Cusco (the historical center of the Inca Empire). For a couple of days we toured various Inca sites to learn about Inca civilization and get acclimated to the high elevation. We were then driven to the Urumbamba River in the Sacred Valley to begin our 4 day trek. 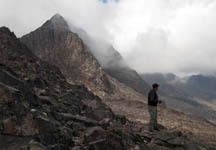 Here is a picture show of our trip and this fascinating place. 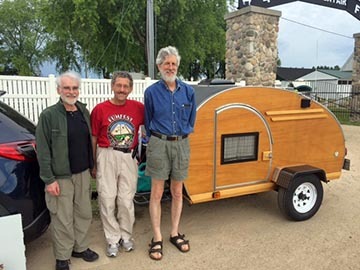 In the summer of 2011 I built a lightweight 5-wide teardrop trailer that I use for travelling to dulcimer festivals and we use for camping trips with fellow TearJerkers. If you are wondering what a teardrop trailer is, visit the Teardrops and Tiny Travel Trailers forum (or click on the image to the right) for pictures, build journals, and lots of information. Many teardroppers are also into dutch ovens and cast iron cooking. As an alternative to cast iron, for potlucks and on the road I often cook in a thermal cooker (I use a Saratoga Jacks 5.5 liter cooker). Here are some of my thermal cooker recipes for those who are interested. Note that we consider ourselves warm water divers only - we don't dive the cold waters off the New England coast (at least not yet...). Here is a photo album of our August 2013 dive trip to Anse Chastanet in St. Lucia. For divers interested in techniques I use to get quality underwater pictures I've written a Guide to Simplified Underwater Photography. Since 2002 I've owned four Miata sportscars, from each of the first three generations (Mazda's current model is the 4th generation). I currently drive a 2003 Splash Green Miata (pictured left). I've been active in the Mass Miata club having been a past Activities Director and then Vice President of the club. I enjoy planning and leading day, weekend and week-long club trips. In 2010 I proposed the idea for a Mass Miata sponsored regional event, and headed up the committee that organized Fall for New England held in October 2012. 120 Miata afficiandos throughout the eastern and mid-western US and Canada attended this event which was a great success. The club is currently planning Fall for New England 2 to be held in September 2019.